Day 6: Shoebill, Birding in Semliki – Queen Elizabeth N.P. Wake –up early in the morning have your respective breakfast and set off for the views of hot springs both the male and the female you enjoy the scenery it’s a photography delight. Semliki is rich in the rare shoebills storks which are spotted in swampy areas it takes about 3/4hours due to the search of shoebills in the swamps if lucky its 2/3hours later proceed to queen while game driving have your packed lunch enroutes and proceed to Queen Elizabeth national park it’s a volcanic formation of the western Rift Valley towards Queen Elizabeth N.P. The descent reveals a stunning panorama of lakes George and Edward amidst game-filled plains. By 4 o’clock go for the unique Boat Cruises that takes 2hrs on the Kazinga channel and onto L.Edward. The trip passes through possibly the highest hippo concentration in Africa and many mammals may be seen drinking water. The cruise offers the excellent platform for photography and game viewing. The birdlife is colorful and abundant. Later your dinner and overnight return to Kazinga channel View Resort/Tembo Safari Lodge. Wake-up early morning have breakfast go for the game drives of which you will see so many animal species like Lions, Leopards, Giant Forest Hog, Buffalo, Elephants, Difasa, Water Buck, Topi, Uganda Kobs are so many and bush buck which are not found in Murchison Falls and it takes 3hrs. Return for your lunch relax for some few hours and then In the evening take a Nature Walks, visit the Bat Caves, and Kyambura Escapements and Forest Walks ,Blue Lake and Salt Lakes where you will have a cross glance of so many species both flora and fauna like butterflies are abundant and different primates with tree species inclusive. Then return at your respective accommodation at Kazinga channel View Resort/Tembo Safari Lodge. 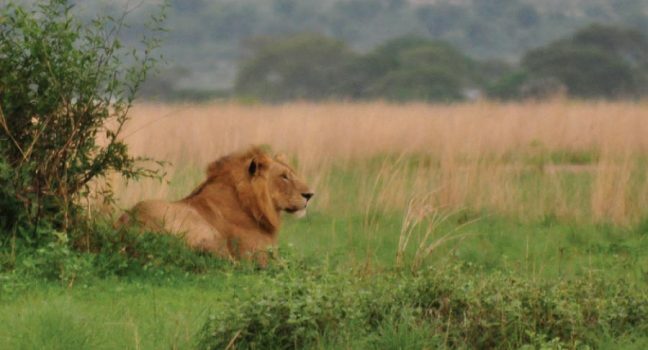 After your breakfast early morning visit Ishasha sector where we find Tree-climbing lions as the only sector for tree climbing lions QNP diverse eco-system of grassy plains, tropical forests, rivers, swamps, lakes and volcanic craters are a home to an incredible abundant wildlife. Then after Proceed to Imaramagambo or Bwindi impenetrable you will reach late evening have nature walks and then go back for dinner and overnight at Broadbill Forest Camp. Wake up early in the morning have your breakfast head to Rwanda virunga forest in Volcanoes national park for gorillas and other primates you will reach late noon time and go for nature walk, where you will reach at Dian fossey the great old volcanoes towering up almost 15000 feet covered with rich green rain forest the rich mosaic of montane ecosystem later return back for the dinner and an overnight at Virunga Hotel/Muhabura Hotel.